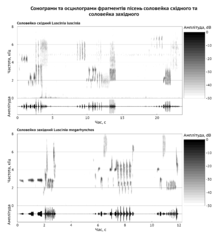 The sonograms of Thrush nightingale (Luscinia luscinia) and Common nightingale (Luscinia megarhynchos) singing help to distinguish these two species by voice definitely. Bioacoustics is a cross-disciplinary science that combines biology and acoustics. Usually it refers to the investigation of sound production, dispersion and reception in animals (including humans). This involves neurophysiological and anatomical basis of sound production and detection, and relation of acoustic signals to the medium they disperse through. The findings provide clues about the evolution of acoustic mechanisms, and from that, the evolution of animals that employ them. In underwater acoustics and fisheries acoustics the term is also used to mean the effect of plants and animals on sound propagated underwater, usually in reference to the use of sonar technology for biomass estimation. For a long time humans have employed animal sounds to recognise and find them. Bioacoustics as a scientific discipline was established by the Slovene biologist Ivan Regen who began systematically to study insect sounds. In 1925 he used a special stridulatory device to play in a duet with an insect. Later he put a male cricket behind a microphone and female crickets in front of a loudspeaker. The females were not moving towards the male but towards the loudspeaker. Regen's most important contribution to the field apart from realization that insects also detect airborne sounds was the discovery of tympanal organ's function. Relatively crude electro-mechanical devices available at the time (such as phonographs) allowed only for crude appraisal of signal properties. More accurate measurements were made possible in the second half of the 20th century by advances in electronics and utilization of devices such as oscilloscopes and digital recorders. The most recent advances in bioacoustics concern the relationships among the animals and their acoustic environment and the impact of anthropogenic noise. Bioacoustic techniques have recently been proposed as a non-invasive method for estimating biodiversity. Listening is still one of the main methods used in bioacoustical research. Little is known about neurophysiological processes that play a role in production, detection and interpretation of sounds in animals, so animal behaviour and the signals themselves are used for gaining insight into these processes. An experienced observer can use animal sounds to recognize a "singing" animal species, its location and condition in nature. Investigation of animal sounds also includes signal recording with electronic recording equipment. Due to the wide range of signal properties and media they propagate through, specialized equipment may be required instead of the usual microphone, such as a hydrophone (for underwater sounds), detectors of ultrasound (very high-frequency sounds) or infrasound (very low-frequency sounds), or a laser vibrometer (substrate-borne vibrational signals). Computers are used for storing and analysis of recorded sounds. Specialized sound-editing software is used for describing and sorting signals according to their intensity, frequency, duration and other parameters. 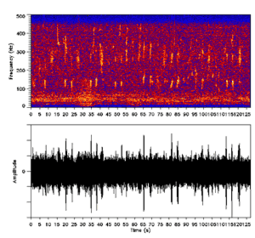 Animal sound collections, managed by museums of natural history and other institutions, are an important tool for systematic investigation of signals. Many effective automated methods involving signal processing, data mining and machine learning techniques have been developed to detect and classify the bioacoustic signals. Scientists in the field of bioacoustics are interested in anatomy and neurophysiology of organs involved in sound production and detection, including their shape, muscle action, and activity of neuronal networks involved. Of special interest is coding of signals with action potentials in the latter. But since the methods used for neurophysiological research are still fairly complex and understanding of relevant processes is incomplete, more trivial methods are also used. Especially useful is observation of behavioural responses to acoustic signals. One such response is phonotaxis – directional movement towards the signal source. By observing response to well defined signals in a controlled environment, we can gain insight into signal function, sensitivity of the hearing apparatus, noise filtering capability, etc. Biomass estimation is a method of detecting and quantifying fish and other marine organisms using sonar technology. As the sound pulse travels through water it encounters objects that are of different density than the surrounding medium, such as fish, that reflect sound back toward the sound source. These echoes provide information on fish size, location, and abundance. The basic components of the scientific echo sounder hardware function is to transmit the sound, receive, filter and amplify, record, and analyze the echoes. While there are many manufacturers of commercially available "fish-finders," quantitative analysis requires that measurements be made with calibrated echo sounder equipment, having high signal-to-noise ratios. Sounds used by animals that fall within the scope of bioacoustics include a wide range of frequencies and media, and are often not "sound" in the narrow sense of the word (i.e. compression waves that propagate through air and are detectable by the human ear). Katydid crickets, for example, communicate by sounds with frequencies higher than 100 kHz, far into the ultrasound range. Lower, but still in ultrasound, are sounds used by bats for echolocation. On the other side of the frequency spectrum are low frequency-vibrations, often not detected by hearing organs, but with other, less specialized sense organs. The examples include ground vibrations produced by elephants whose principal frequency component is around 15 Hz, and low- to medium-frequency substrate-borne vibrations used by most insect orders. Many animal sounds, however, do fall within the frequency range detectable by a human ear, between 20 and 20,000 Hz. Mechanisms for sound production and detection are just as diverse as the signals themselves. ↑ "Bioacoustics - the International Journal of Animal Sound and its Recording". Taylor & Francis. Retrieved 31 July 2012. ↑ Glen Wever, Ernest (2008). "Sound reception: Evidence of hearing and communication in insects". Britannica online. Retrieved 2008-09-25. ↑ Sueur J.; Pavoine S.; Hamerlynck O.; Duvail S. (December 30, 2008). Reby, David, ed. "Rapid Acoustic Survey for Biodiversity Appraisal". PLoS ONE. 3 (12): e4065. Bibcode:2008PLoSO...3.4065S. doi:10.1371/journal.pone.0004065. PMC 2605254 . PMID 19115006. Retrieved 2009-01-19. ↑ M. Pourhomayoun, P. Dugan, M. Popescu, and C. Clark, “Bioacoustic Signal Classification Based on Continuous Region Features, Grid Masking Features and Artificial Neural Network,” International Conference on Machine Learning (ICML), 2013.